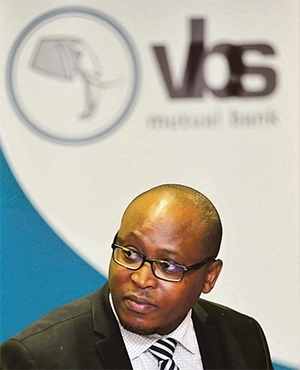 An explanation by VBS Mutual Bank's chief executive officer about an alleged R15m bonus paid to him, which he says he earned for other reasons, has been described as absurd and bizarre by a legal representative. VBS CEO Andile Ramavhunga became the focus of sequestration proceedings in the South Gauteng High Court on Tuesday afternoon. A sum of R15m that was paid to him in 2017 was questioned. Earlier on Tuesday provisional sequestration orders were granted against Tshifiwa Matodzi, the former chair of VBS’s board of directors and also the director and chairperson of Vele Investments, as well as Phillip Truter, the bank's chief financial officer; and Phophi Mukhodobwane, VBS’s general head of treasury and capital management. Vele Investments, VBS’s main shareholder which allegedly also benefited from alleged fraud carried out by bank executives, was also liquidated. VBS was placed under curatorship in March this year and SizweNtsalubaGobodo Advisory Services (Proprietary) Limited, represented by Anoosh Rooplal, was appointed to deal with this. In an affidavit, Rooplal previously said that on October 5, 2017, a “fictitiously generated deposit of R350m was created” in the account of Vele, which was a client of VBS. The same day that the account was created, Matodzi and Mukhodobwane held a meeting in Sandton where Mukhodobwane was instructed to pay bonuses, including R15m to Ramavhunga. However, in an affidavit, Ramavhunga denied the R15m was a bonus. Ramavhunga said he would receive a 2% introductory fee and a 3% success fee and these would come from a R300m down payment for the business. But on Tuesday this version of events was questioned. “No CEO would ever do that,” Antonie argued. An application to try and have the estate of Robert Madzonga, VBS’s previous chief operations officer and the group executive officer of Vele Investments, provisionally sequestrated may also be heard on Tuesday.